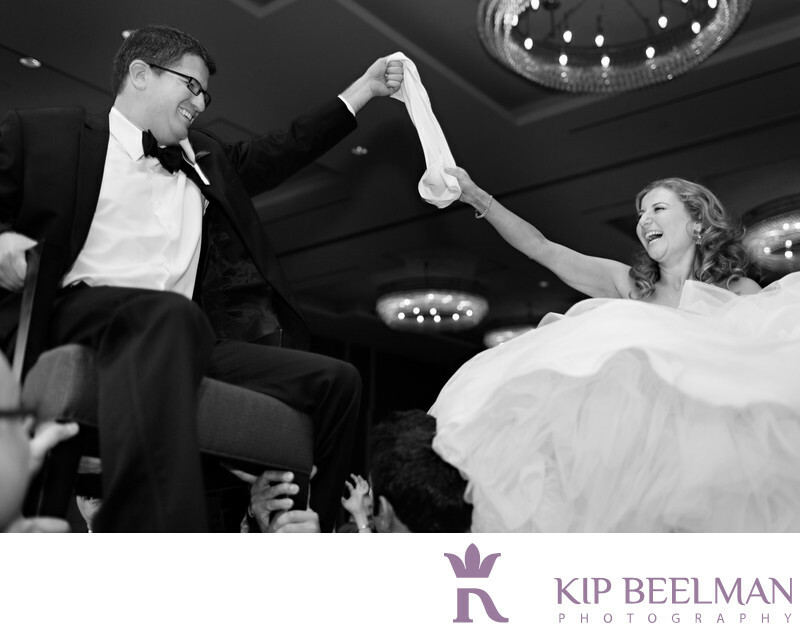 The hora and “Hava Nagila” were in full swing for this stand-out Four Seasons wedding photography. This chic New York couple held their wedding ceremony and reception in Seattle at the modern Four Seasons Hotel, which is perched over Seattle’s historic waterfront. The stylish hotel offers sweeping views for miles of Elliot Bay, the Olympic Mountains, Puget Sound and Seattle’s latest attraction, the Great Wheel, all in the heart of downtown and adjacent to Seattle’s famous Pike Place Market. Before this wild dance, we took portraits of the couple and bridal party at the nearby Pike Place Market, a location that always provides variety, energy and a very Seattle feel for unique wedding photography. This Jewish wedding ceremony took place under a lovely chuppah and the bride circled the groom seven times in keeping with tradition. Thanks to the hotel’s fantastic floor-to-ceiling windows, we enjoyed great light for wedding photographs as well as memorable Seattle views. Even with the expansive views and big emotions, the ceremony felt intimate and personal. This festive image was taken during the hora dance while “Hava Nagila” whipped the guests into a celebratory frenzy. I love the black and white look to showcase the laughter and delight on the couple’s faces as well as the bride’s dress and the warm lights above. After the dance eventually ended, the excitement just continued from there as the guests went wild in Seattle's best photo booth, the incomparable Lightning Booth, all night long. From coast to coast, this wedding married tradition with modern and fun with sweet. Location: 99 Union St, Seattle, WA 98101. Keywords: Four Seasons Hotel (6), Hotel Wedding (48), Jewish Wedding (18), Seattle (111).